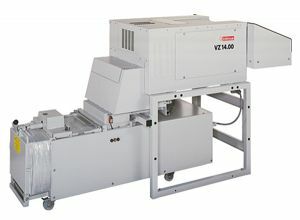 For decades, the intimus® heavy duty shredders have proven to be centrally positioned pieces of equipment for the privacy-friendly disposal of disused media. The model range offers variations that can handle up to 550 sheets/h or even complete folders in a single operation. The spacious feed table with integrated infeed conveyor belt provides controlled, effortless, safe and fast loading. The shredded material is collected in large-scale, mobile or swing-out containers under the cutting mechanism. The shred-press combinations are coupled to a baler for immediate fully automatic compaction of the cut material into compact bales. Reduction effect compared to the loose collection of the cuttings is about 70%.